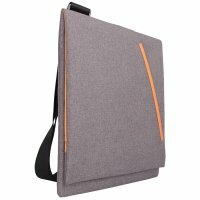 This sleek design messenger shoulder bag is suitable for most of tablets. Has safe zippered accessories pocket and thee inside pocket with bright orange linen. During the day it fits business style and it will look elegant at the evening walk.